Personalization is a key part of Internet search, providing more relevant results and gaining loyal customers in the process. But new research highlights the privacy risks that this kind of personalization can bring. A team of European researchers found that they were able to hijack Google’s personalized search suggestions to reconstruct users’ Web search histories. Google has plugged most of the holes identified in the research, but the researchers say that other personalized services are likely to have similar vulnerabilities. “The goal of this project was to show that personalized services are very dangerous in terms of privacy because they can leak information,” says Claude Castelluccia, a senior research scientist at the French National Institute for Research in Computer Science and Control, who was involved with the work. The work will be presented this summer at the Privacy Enhancing Technologies Symposium in Berlin, Germany. Good point – yet another “cloud” risk factor. There are many other reasons to be wary of search personalization – I see it making the web ever less global, more local, more “tribal”, more solipsistic. Blog cooking on this topic. A TENNIS racket, a teddy bear, even a cooked lobster and a corn cob – if a rocket can be strapped to it, it is a worthy entrant. 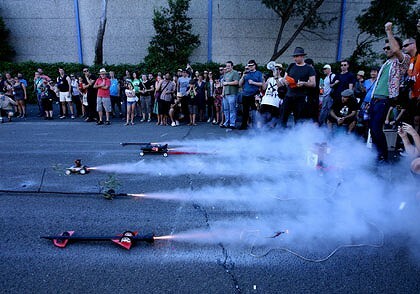 What started as the obscure passion of a few mates – launching model rockets into the sky – has become somewhat of an underground phenomenon, with a couple of hundred people turning out yesterday afternoon to watch the rocket races in the backstreets of Marrickville. Many thanks to the organizers of Rocket Car Day – my family had a blast 🙂 (4 of 5 of us are in this picture.) The event is both gloriously silly and extremely appealing. The mash up of arbitrary car and chemical rocket brings out a great range of the Sydney tech and creative scene. We had no cars this time, but did have in the last few (Including @andragy’s failwhale). My pictures to come soon (assuming they worked). In the mean time, check out http://rocketcarday.com. Today’s improvements include GoogleWave-like instant collaboration, and radically improved formatting. For more details, see http://googledocs.blogspot.com/2010/04/new-google-docs.html. Is this disruption in action? 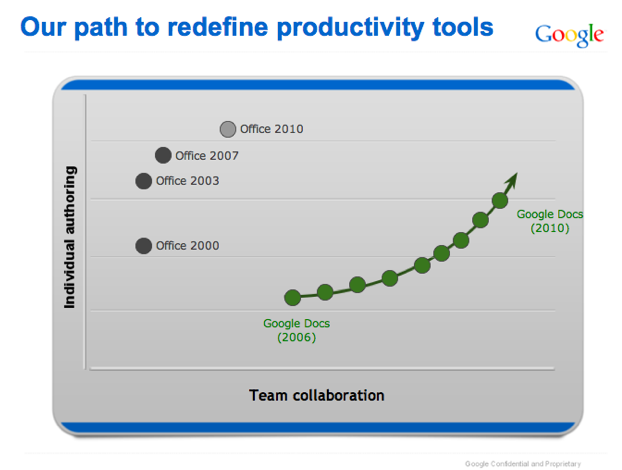 Is live collaboration of this type a sufficiently large need? Is this just a matter of Google Docs putting a pretty picture on a very slow catch up with Microsoft functionality? First in a series of posts on the architecture of gender in the infrastructure of the internet. Fascinating. I am particularly intregued by physiological reasons for ease of viewing rectangles with rounded corner rectangles, and implications of motion blur.